Raising armies is more than counting people, putting them into uniform, and assigning them to formations. It was, and remains, an exceedingly complex business. It demands efficient measures and processes for recruitment and selection in voluntary military systems and equally efficient measures for registration and assignment in armies built on conscription. It demands training establishments capable of transforming factory workers and farmers into riflemen, in addition to providing them with officers, staffs, and commanders to lead them. It demands balance between the needs of the armed services, industry, and agriculture. And, often overlooked, it demands medical services to mend soldiers when wounded, and programs and pensions to look after them when demobilised. How did the the British Empire and Commonwealth mobilize manpower for the armed services, agriculture, and industry during the two world wars? And how did they care for veterans, both able-bodied and disabled, when the fighting was over? 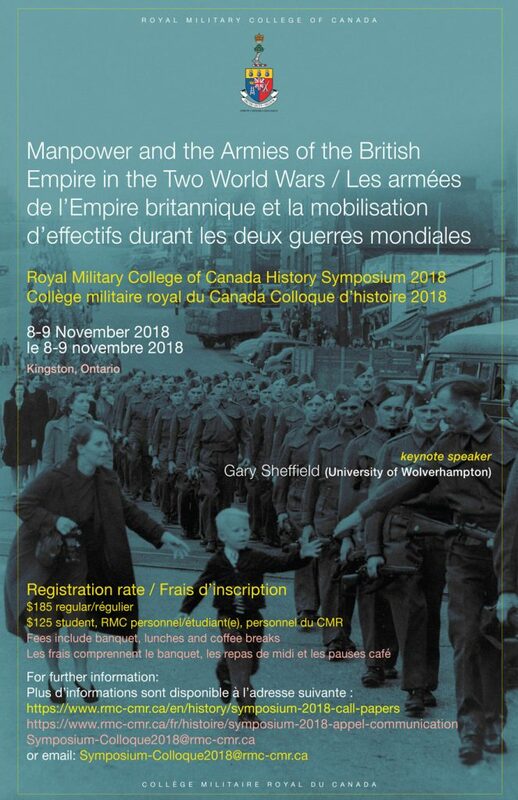 “Manpower and the Armies of the British Empire in the Two World Wars” will bring together a diverse group of distinguished historians, junior scholars and graduate students to undertake a multifaceted examination of army mobilization for Britain, India, and the dominions. Confirmed speakers include: Gary Sheffield (University of Wolverhampton), Richard Grayson (Goldsmiths, University of London), Kent Fedorowich (University of the West of England), Peter Dennis (University of New South Wales), Jessica Meyer (University of Leeds), Kaushik Roy (Jadavpur University), Jonathan Fennell (King’s College London), Daniel Byers (Laurentian University), Ian McGibbon (Ministry of Culture and Heritage, New Zealand), Ian van der Waag (Stellenbosch University), and Meghan Fitzpatrick (Royal Military College of Canada). The conference organizing committee solicits proposals for papers along the lines of three basic themes: (1) recruitment/conscription and selection, (2) training, employment and the experience of soldiers, and (3) demobilization and veterans’ care. We would also welcome papers that examine manpower in relation to culture, class, gender, race, or disability. Proposals should include a 200-300-word abstract accompanied by a one-page CV. Proposals should be emailed to [email protected] no later than 22 June 2018. Cornell University Press will publish the proceedings of the conference.